As many of you who have read my work in the past know, I expect the eventual endgame to this whole Keynesian monetary experiment that has been going on ever since World War II, to finally terminate in a global currency crisis. I’m starting to wonder if we aren’t seeing the first domino start to topple. I’m talking about the Japanese Yen of course. I think everyone just naturally assumes that the Yen is dropping in response to Prime Minister Abe’s intent to imitate US policy and print it’s way out of its troubles. The problem with this strategy is of course, eventually you will break your currency. Japan is in a particularly tenuous situation in that their debt to GDP dwarfs most of the rest of the world. The only hope they have of servicing this debt is for interest rates to stay basically at zero. Any move by interest rates above this artificially low level and Japan’s debt becomes unserviceable, without resorting to a greater and greater debasement of the currency. Unfortunately that will also result in an acceleration of the collapse of the currency, which would just cause Japanese bonds to be sold even more aggressively. A nasty catch-22 situation. At this point there is no way out for Japan. The only question is when will the endgame arrive. Japanese bond bears have been asking themselves that question for almost 2 decades. 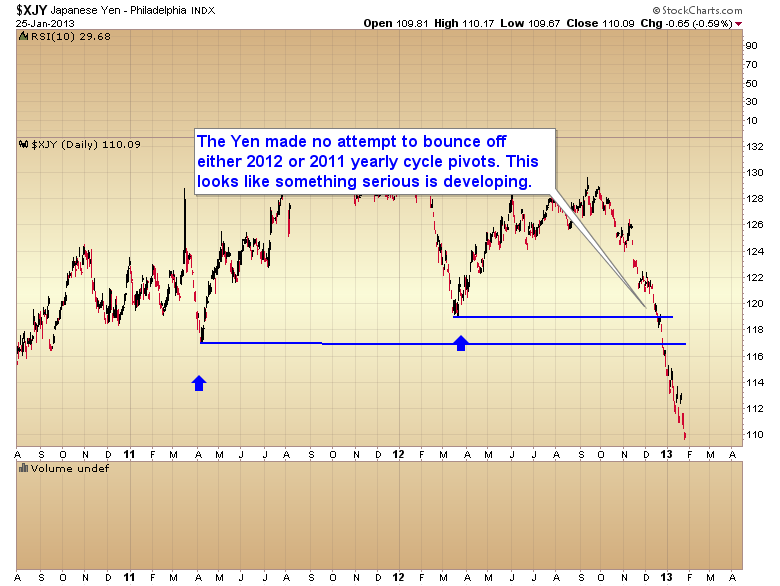 The recent move in the Yen has started me wondering if that end game hasn’t now begun. In the chart below I have marked the successive yearly cycle lows with blue arrows. 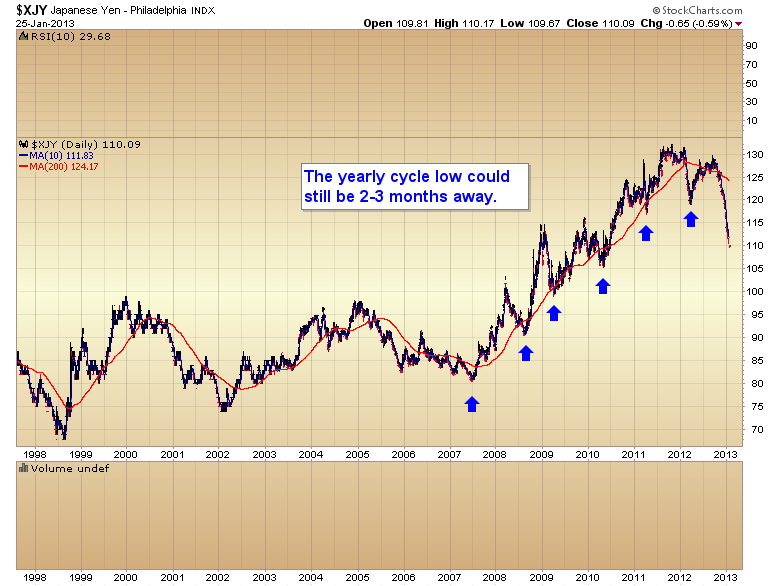 As you can see this major cycle bottom tends to arrive between March and May most years. If the 2013 yearly cycle low arrives in the normal timing band, then there may be a big problem developing with the Japanese currency. The reason I say that is because the Japanese Yen is basically already in free fall and we may still have another one-three months to go before a final bottom. Another warning sign is the fact that this decline cut through not only the 2012 yearly cycle low, but also the 2011 yearly cycle low and never even blinked. In an orderly decline both of these levels should have generated at least a decent bear market rally. 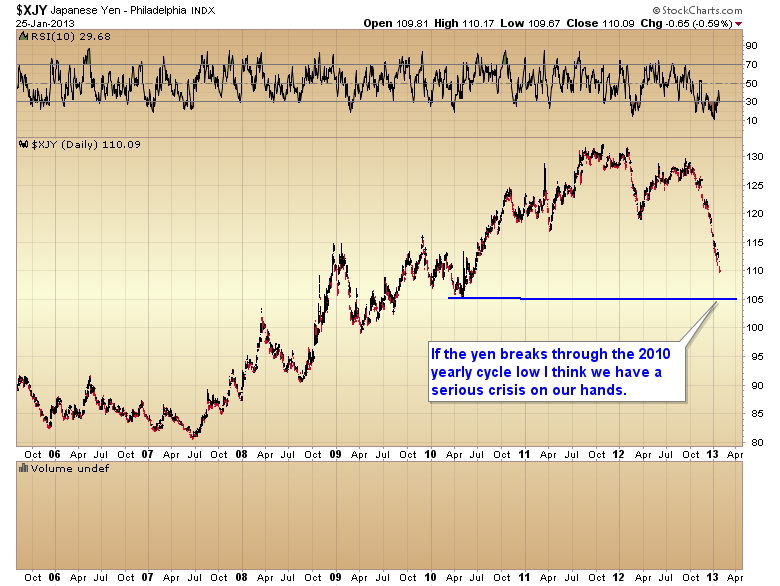 In my opinion, it’s very worrisome that the Yen didn’t even slow down as it moved through these major support levels. The next major support level is at the 2010 yearly cycle pivot. If the Yen slices through this support level also, then I think we have a major currency crisis on our hands. Needless to say if the world sees a major currency collapse, which up to this point I think most people would consider to be an absurd idea, it’s going to spark a panic for protection. Despite stocks entering the euphoria stage of this bull market, stocks are not going to protect one from a currency crisis. Only hard assets will do that, and the two hard assets that are best at protecting one’s wealth are gold and silver. Wouldn’t it be fitting that at a time when gold and silver are about to be most cherished, they are now completely loathed by the market? This entry was posted in Uncategorized on January 27, 2013 by Gary. The big news for Thursday is that gold formed a weekly swing. Considering that the QE4 manipulation stretched the intermediate cycle way beyond its normal timing band, this weekly swing should confirm that the yearly cycle low is complete. We did see profit-taking come into the market as soon as gold tagged its 50 day moving average. I don’t see anything unusual in that, as gold has delivered a 75 point rally in only nine trading days. The 50 day moving average is a logical place for short term traders to lock in some profits. On another note, this was the third attempt in two weeks by the shorts to drive gold down. It worked for a couple of weeks after QE4 and even for two days at the beginning of January, but I think the complete failure today to hold gold down against its natural trend is probably the signal that the market has broken the short-term manipulation. I think any further attempt at short-term manipulation and the shorts are just asking to get their head handed to them. Shenanigans are not out of the ordinary on options expiration. So we could very well see another attempt to drive gold down on Friday. If this one fails also, and it probably will if the dollar is falling, then I don’t think it will be long before the gold chart starts to look like the platinum chart. Next I want to discuss the mining stocks. It seems everyone has an excuse for why the miners have underperformed lately. Needless to say I don’t really buy any of that nonsense. However I am as confused as everyone else to come up with a reasonable explanation for why miners continue to sell for these ridiculously cheap valuations. Whenever I am confused, usually the first thing I do is pull up a very long-term chart so I can get a feel for what is really going on, and eliminate the distraction of the day to day wiggles. I think we are all wondering when the miners are going to join the party as it certainly appears that gold and silver both have formed major yearly cycle bottoms. What I saw was quite a surprise. The character of the mining sector has changed completely. For the first time in this bull market miners are forming a rounded base instead of the typical V-shaped bottom. A rounded bottom is a much more powerful basing structure than a V-shaped recovery. If you believe like I do that gold is going to $3500 – $4000 over the next two years, then I would have to say there is no way it is going that high without taking the miners with it. As a matter of fact, I don’t think there’s any way gold goes to even $1900 without taking the miners with it. The complete loathing & disgust that we are seeing for the mining sector, coupled with the character change in the bottoming process is the setup in my opinion, for a huge move in this asset class over the next two years. I can’t tell you exactly when the move will begin, but like I said, I don’t believe for a second that gold is going to $4000 without taking the miners along for the ride. For what it’s worth, I saw the exact same sentiment in silver back in August of 2007. When silver broke through its last support level everyone threw in the towel. As you can see from the chart that was the exact moment one should have been buying, or if you already had positions, it was a huge mistake to get knocked off the bull. This is just another example of technicals not working in the volatile precious metals sector. I’m pretty sure every technical trader in the world sold when silver broke through that $12 support level. It caused them to miss an almost 100% rally over the next six months. If you believe in the bull market, and I think most everybody here does, as I tend to focus on gold, and I suspect that is the reason most people bought a subscription in the first place, then all one needs is the patience to let the bull run its course. If you get sidetracked like the silver traders in the summer of 2007, you aren’t going to do yourself any favors. If you are here to ride the bull market, then ride it and don’t worry about whether or not you made money today or yesterday. The only thing that makes any difference is how much money you make by the time the next C-wave tops, and that has nothing to do with what happened this week, last week, or last month. It has to do with what is going to happen over the next two years. If I’m right about where gold is going then it is definitely going to be worth the hassle of letting the miners complete this rounded base, because the upside once it’s finished is huge. If you don’t believe in the bull market then you probably have the wrong newsletter. My goal isn’t to make a couple of percent trying to jump in and out of momentum stocks. My goal is to double or triple your portfolio by 2014. However, I can’t do that unless you have the patience to hold on through all of the bulls tricks and curve balls. I can keep subscribers focused on the big picture, but patience is something everyone has to learn on their own. I can say that the traders that had it during the last C-wave were well rewarded. This entry was posted in Uncategorized on January 18, 2013 by Gary. I realize that this extended (and somewhat manipulated) move into a yearly cycle low has frustrated most investors to the point where they have no more patience left, and have lost sight of the big picture. So I am going to go over it again, because I think it is a huge mistake to lose sight of the reason why we are investing in this sector to begin with. To start, I’m going to assume that gold will drop down into another eight year cycle low pretty much on schedule sometime in late 2015 to mid 2016. As long as that assumption is correct then I think we also have to assume that there is another C-wave advance between now and then. The reason I say this is because all markets are governed by the forces of action and reaction. 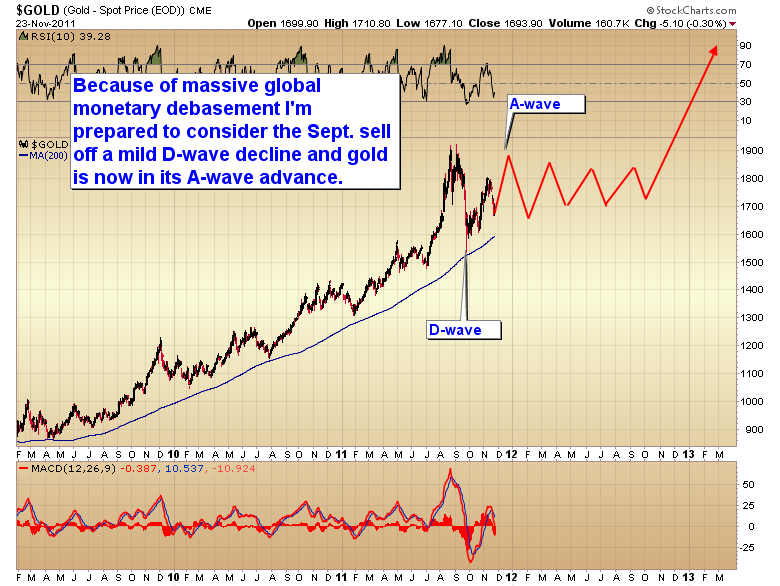 Hence in order for gold to drop down into a correction severe enough to be considered an eight year cycle low, it first has to generate a rally big enough to trigger a profit-taking event of that magnitude. That is a small sample of the latest Weekend report. In all fairness I have been warning traders that this was coming. This is a chart I posted to the blog on November 24 2011. Frustrated gold bugs may want to read the entire weekend report before you throw in the towel on the sector. The 16 month correction is completely normal and should soon generate another huge leg up in this massive bull market. I will reopen the $1.00 two day trial subscription for anyone interested in reading the report. If you decide you want to continue accessing the nightly reports do nothing and the trial will automatically convert to a monthly subscription after the second day. If you are only interested in reading the weekend report just cancel the subscription by following the directions in red print on the home page before the second day expires. This entry was posted in Uncategorized on January 13, 2013 by Gary.